Provinces with more physical cannabis stores saw significantly higher per-person sales in the six weeks after Canada’s legalization of recreational marijuana, according to new data from Statistics Canada – an indication that consumers have a strong preference to buy their cannabis offline. British Columbia – the province with the biggest underground cannabis economy – reported the lowest per-person legal cannabis purchases, at just 68 Canadian cents per person from sales of 3.3 million Canadian dollars ($2.47 million). Prince Edward Island led Canada with CA$13.83 in sales per person. Next in line were Nova Scotia (CA$11.33), Newfoundland and Labrador (CA$8.17) and New Brunswick (CA$6.87). Alberta, which saw 17 stores open on Day One, was the best-performing province in Western Canada with CA$4.52 in sales per person generated from CA$19.4 million in sales. Louis Barre, president of Ottawa-based Cannab Intel, a marijuana consultancy, said the data shows that consumers want retail storefront access. “They may be viewing their first online purchases as a trial of the product and online process, especially given some of the negative experiences in terms of slow delivery times and quality issues; hence, making smaller initial purchases,” he said. Deepak Anand, a cannabis industry expert based in Vancouver, British Columbia, said the regulated market is seeing the repercussions from the slow rollout of physical stores in some provinces. “Clearly (B.C.) has to hand out more licenses, and we’ve seen that,” he said. “Over the past few weeks, we’ve seen seven more store licenses being approved, including a mix of private and public stores. 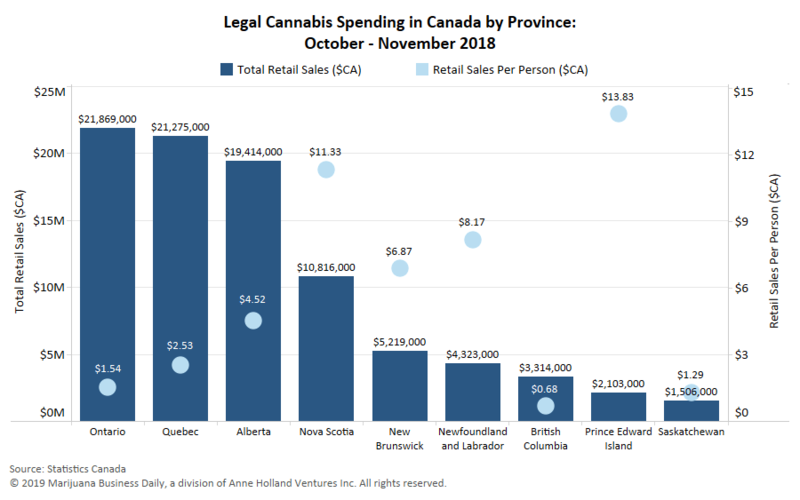 From Oct. 17, 2018 – the first day of legalization – to the end of that month, Canadians spent CA$43.07 million on legal cannabis. That total rose to CA$54.36 million the following month. Ontario, despite its troubled rollout, edged out Quebec to lead Canada in total sales, at CA$21.86 million and CA$21.27 million, respectively.